New patients receive Free in Office Whitening with a new patient exam. Sign-up using the form or call us at (519) 578-2419 to take advantage of this exclusive offer. Kitchener East Family Dental offers our patient form(s) online so they can be completed in the convenience of your own home or office. Whether you need cosmetic dentistry, sedation dentistry, pediatric dentistry, dental implants, teeth whitening, or a top quality general dentist, we can meet your needs, and exceed them. We pride ourselves on being a family dentist, one where your entire family of all ages feels welcomed, valued and truly cared for as individuals by a team of the top dental professionals in the state. In fact, we have patients come to us from all around the Kitchener area. This is because they know we provide personalized care and use the latest and best dental technologies. Each member of our team is specially selected for their expertise and caring. A caring attitude is very important to us because we want all of our patients, even the children, to feel relaxed and comfortable while they are with us. We take extra pride in making sure we never begin dental exams or any other procedures for you until we have answered all of your questions to your satisfaction. You deserve and have a right to know exactly what we will be doing to you, why we are doing it, and what you can expect from it. It is also our goal to make every treatment as easy on you as possible. That is why we offer sedation dentistry for those who are a little jumpy around dentists, Invisalign for those who want straighter teeth without having to wear traditional braces, and much, much more. In addition, we are always committed to keeping you as informed as possible about every aspect of your dental care, including the financial aspect. This means we always discuss our large variety of financing and payment options with you before we begin treatment, so you can choose the method of payment that is easiest on your budget. You are assured that your Kitchener dentist doesn't want finances to ever be the reason you don't get the dental treatments you need, want, and deserve. Your trip to our office will be a pleasant one, whether you are coming in for a general dental exam, a filling, a crown, Invisalign, or more. We will even check on you after major procedures, to make sure you are doing all right, and to see if you need anything to ease your recovery. We are able to offer you all of the most in-demand cosmetic dentistry procedures here and have the highest technology available for oral health. When it comes to choosing a dentist that has it all, and a commitment to kindness and caring, as well, you will be delighted with Kitchener East Family Dental. 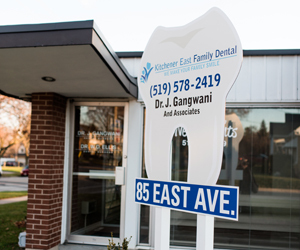 Our individualized, high-tech approach to dentistry makes Dr. Jitendra Gangwani and the Kitchener East Family Dental staff the dentistry team of choice in the Kitchener, ON area. Why wait to get on the road to a beautiful new smile and robust, vibrant good oral health? Contact us today to make your first appointment and know your teeth are in excellent hands with us. We are looking forward to meeting you and welcoming you to the Kitchener East Family Dental family. You've waited long enough for the best smile and oral health of your life. Contact us today at (519) 578-2419.